A mate and I went to one of the Randwick Race Course CCR concerts. It was our last year in high school and this was the first major rock concert I went to. CCR were the biggest band in the world at that time and a massive crowd turned (about 20,000 by some reports). It was extremely hot and the crowd were a bit restless, somebody even threw an apple at CCR’s drummer (it wasn’t me!). Before CCR though their were a couple of Aussie support bands – Country Radio and Sherbert. Country Radio were particually impressive. Sherbert were probably a bit “poppy” for this rock crowd but worked hard to win the audience over, which they did. One of their lastest songs, the rocker, “You’re All Woman” (by Ted Mulry)went down very well. CCR arrived in limo’s via the racetrack. Rolling Stone mag said they were accompained by every well known Aussie groupie! CCR, despite not having Tom Fogerty in band anymore sounded full and loud. They just went from one classic rock song to the next. There is actually a Youtube clip of this concert of them playing “Hey Tonight” (from GTK). I was also at the CCR concert at Randwick Racecourse on Sunday 13 February 1972 with my ex-wife, it was a beautiful sunny afternoon, I remember that there was a delay in the concert starting and over the PA music system “Bip Bop” Paul McCartney & Wings was played and sounded fantastic in the open air on that summers day and later the three CCR members (without Tom Fogarty) arrived driven onto the racecourse separately in a black limousine each, I think there were three or four Australian support bands: Sherbet; Country Radio and not sure if it was the La De Da’s and Tamam Shud. 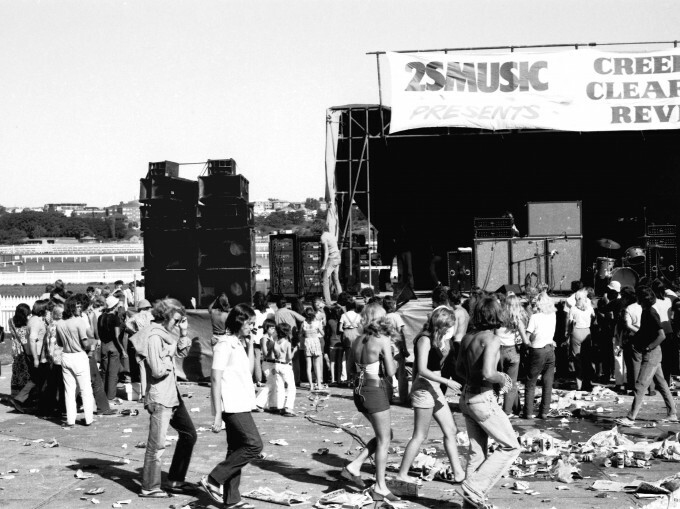 I was also at Randwick Racecourse for one of these concerts. I was very disappointed with the fact that they only played three or four songs, then departed the stage after only 15 minutes or so. Left in a limo and didn’t even return for an encore.